This year I was hoping to get ridiculously organised with Christmas super early – taking a bit of the stress off during the mad December last-minute shopping (which usually occurs on Christmas Eve. Haha… but seriously, not joking). I’ve (as usual) been trying to become more organised to help save time and money wherever possible by planning ahead. One of my ideas this year is to make some homemade Christmas hampers for family and friends packed with plenty of homemade goodies. 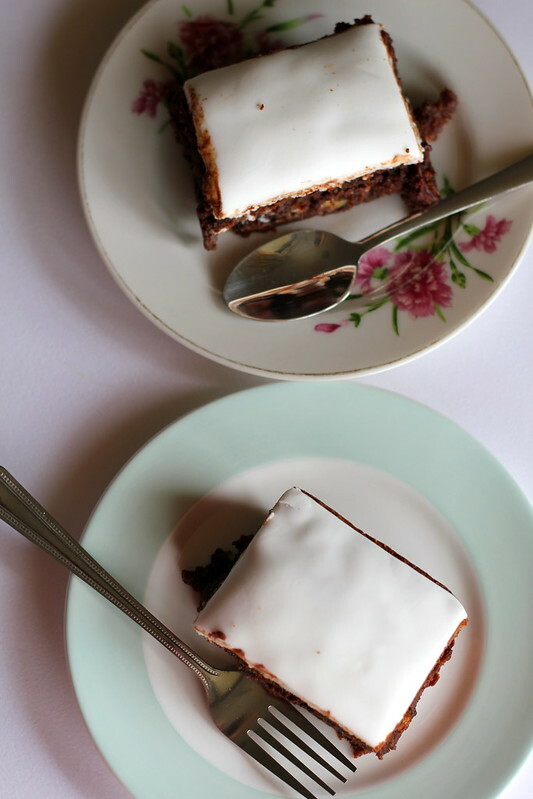 One of these recipes I plan to include are these Christmas brownies! How lucky was I, then, to be sent a package of Lucky Nuts from Nuffnang to review? It also gave me a chance to completely stuff a brownie recipe full of nutty goodness – as if I needed a reason. 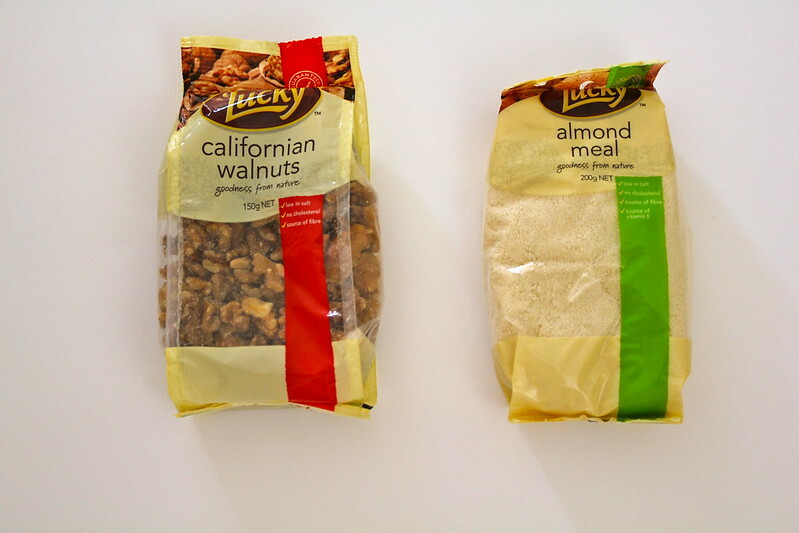 While I haven’t used Lucky Nuts in the past for baking, I certainly have used them for everyday uses: sprinkling them in cereals, adding them to pestos and dips and, of course, snacking on at work! Aside from being a good quality product, I like that they’re so conveniently accessible from Coles and Woolies, which is a big plus in my books. All in all, they definitely turned out well in this recipe! These brownies are based off Nigella Lawson’s Flourless Brownies, but packed with extra goodies – more nuts, cherries and chocolate chips, and topped with a layer of fondant. I had never tried baking flourless brownies before but was pleasantly surprised with the result – a dense, incredibly moist and chocolatey brownie, stuffed with extra nutty goodness. 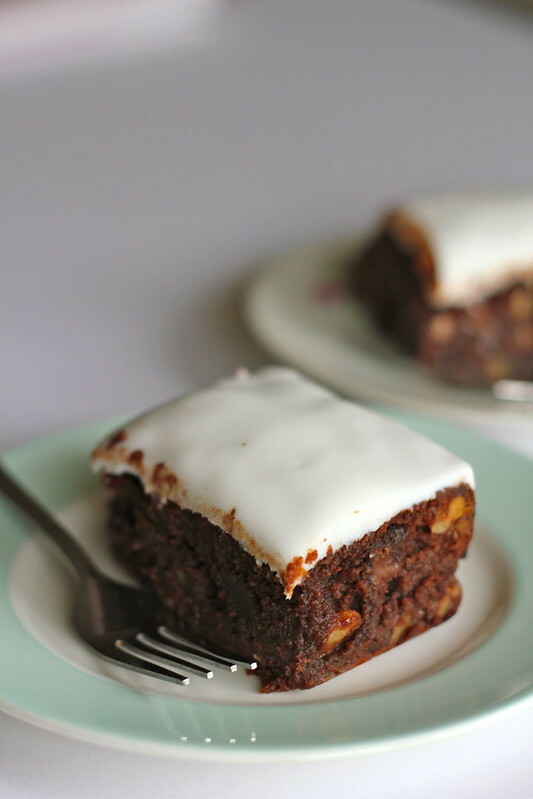 It reminded me of a chocolatey version of a Christmas cake – you could add some liquor, extra nuts and dried fruit to emulate this if you wish but I think they’re pretty good the way they are! Since this recipe uses almond meal instead of flour, these brownies are also perfect for gifting to your gluten intolerent friends and family! This recipe is also great for cleaning up as it is all made in the one pan. 250 g (or 1 cup) dark chocolate chips You can also use white or milk choc chips to mix things up a bit! Preheat oven to 150 degrees C and butter / line a brownie tin with baking paper to prevent sticking. Melt butter over a low heat in a saucepan with high sides. 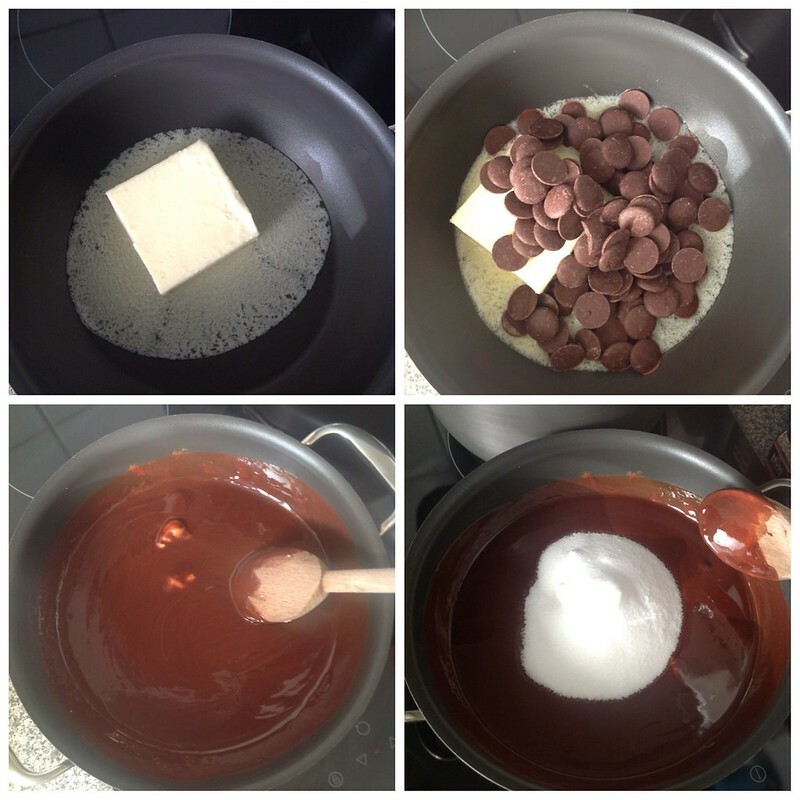 Add baking dark chocolate and stir until butter and chocolate melt together. Take off the heat and allow to cool for about 10 minutes. Add sugar and vanilla essence (if using). 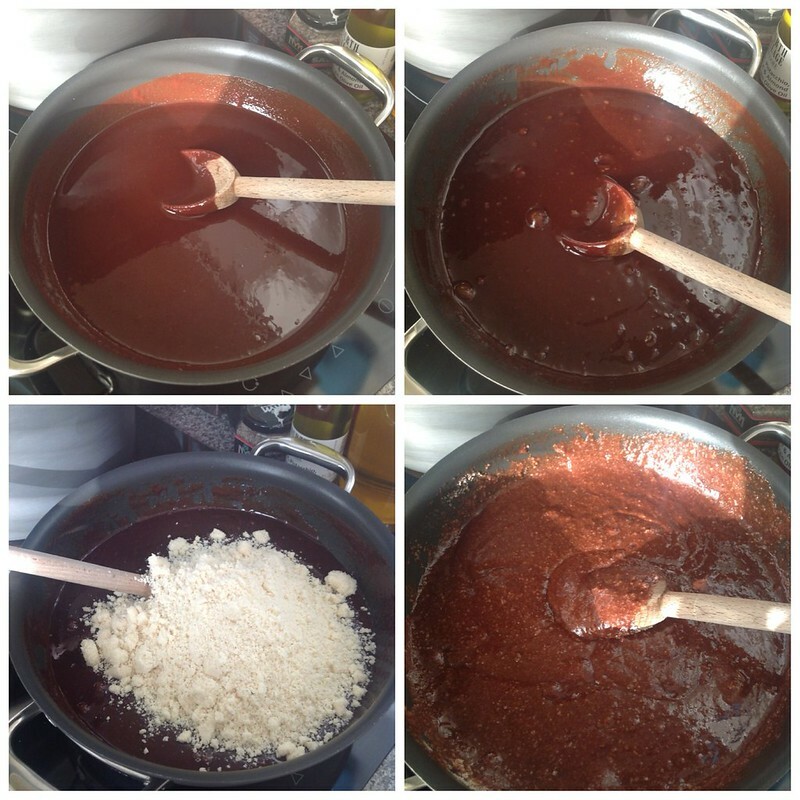 Temper eggs by adding a little of the warm chocolate mixture to your beaten eggs and mix together. Add eggs to saucepan and stir until mixed in. Add almond meal and stir until fully combined. Add walnuts, cherries and chocolate chips. If you wish to add any other dried fruit/nuts, etc. do so now. Pour brownie mix from pan into lined tin and bake at 150 degrees, or until a thin blade comes out of the brownie with moist crumbs sticking to it. Roll fondant out until at 2cm thickness. Moisten the top of your brownie with water and top with fondant. Brownie slices best after being refrigerated overnight. Serve and enjoy! View pics left to right, top to bottom. Hope you are all having a great week and aren’t getting too stressed out by impending Christmas shopping! With lots of love from the freshly-turned 25 me! Disclaimer: Cooking Crusade was sent Lucky Nuts to review by Nuffnang (Product Talk by Nuffnang), however the opinions in this post are my own. Happy Birthday. These brownies look super good. I totally believe in being organised for Christmas – these are perfect too for the occasion. Happy birthday! You seem to be well into the Xmas spirit already with these delicious looking brownies. Thanks Kat!! I’d never added nuts before to brownies (silly me!!) but now I’m addicted! Sooo good! Happy Birthday!! ( I miscounted it and I thought it’s on Thursday, lol). 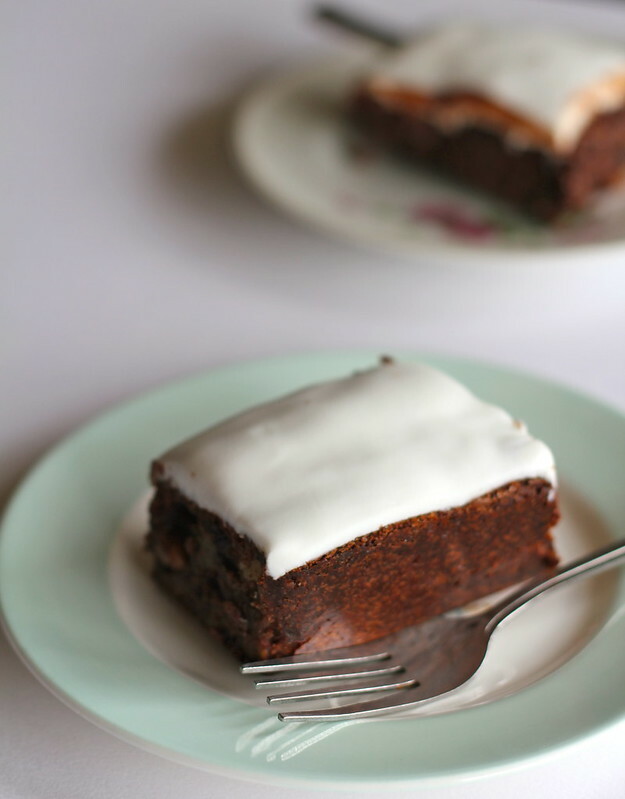 I always love flourless cake, and your recipe looks so amazing! So wonderful!!! These brownies look so pretty! And I praise your planning efforts! I haven’t made a single Thanksgiving dish yet this month, I will only start my Thanksgiving cooking this Thursday :), but you’re already baking for Christmas! Bravo! Heheh thanks Julia! Ooh I’m so jealous of Thanksgiving – we don’t celebrate it in Australia but turkey, sweet potato and pumpkin pie sounds pretty amazing to me! Would love to do my own one day! I bet yours will be amazing!! these looks DIVINE. love the icing. will probably make them for christmas! Happy birthday and have a happy Thanksgiving! Happy belated birthday Christine! Thanks for the recipe, sounds delish. I love the sound of these Christmas brownies! 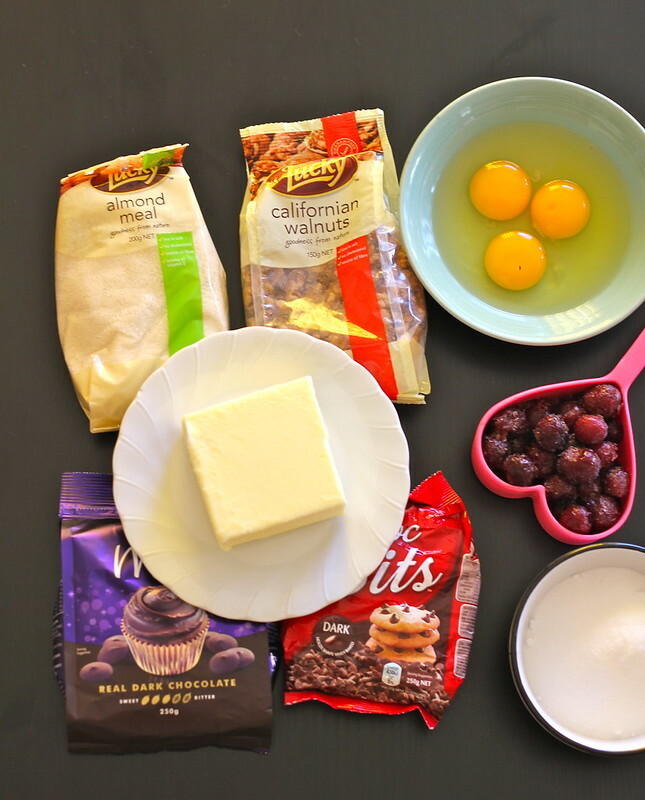 The cherries would go so well with the chocolate here … I will have to give this a try the next time I make brownies. And they look so elegant with the white fondant – a perfect idea for Christmas. Great idea, I’m not a big fan of Christmas cake so this looks like it but tastes much better!! Mmmm yummo! Will definitely be adding that one to the recipe book! Oh and a huge belated happy birthday!!! Hope the “Mr” spoilt you appropriately! Hehe thanks and me too! I know, how quickly is Christmas racing up on us! Such delicious looking brownies and flour free! Thanks Sara! Its coming around so quickly… Where did this year go? !